When you are injured in an accident, it can be painful, confusing and frightening. Everything that immediately follows can seem to happen in a blur. You may have trouble understanding the details of the accident. If you are like most people, you may not know what to do next. You may not know where to turn to deal with the challenges ahead of you – including fighting with insurance companies, missed work and mounting medical bills. As a personal injury attorney, I want you to know that you do not have to go through this alone. At my Albany area personal injury firm, I help clients like you with a wide range of personal injury cases, including car accidents, motorcycle accidents, workplace injuries, slip and falls and more. I understand what you are going through, and I am ready to use my extensive experience in personal injury law to help you obtain compensation for what happened. When you are driving you have an expectation that other drivers will obey the law and the rules of the road. Yet everyday people ignore or purposefully break traffic laws. They may be late for work, they may be intoxicated or they may be malicious. Whatever the reason, reckless behavior on the road can lead to serious injuries and death. My firm can help you to successfully pursue damages for this reckless behavior, both from the driver and the driver’s insurance provider. I can also ensure that your own insurance company treats you fairly. As a rider, you are more exposed to injury than most automobile drivers realize. One careless move from a car or truck driver can cause you life-altering injuries, if the accident does not kill you. My firm helps riders get compensation for injuries caused by reckless drivers, and we are ready to do the same for you. You have a reasonable expectation of safety when you go to your job. There are numerous rules and regulations in place to protect you at the workplace, whether you work in an office or on a construction site. Yet some employers try to cut corners, leaving you and your coworkers exposed to injury. While workers’ compensation may cover part of your needs, it rarely covers all of them. Sometimes, you do not even get the level of workers’ compensation you should be entitled to. I can set things straight with all parties through aggressive legal action, helping you get the money you need following the accident. Sometimes when you are working in certain situations – like in construction – your injury may be caused by a party other than your employer. Pursuing a sub-contractor or faulty equipment involves going after a third party, something I am familiar with. Any damages you collect from a third party claim will be in addition to your existing workers’ compensation claim. Premises liability covers accidents that happen in a place of business due to negligence. Slip and fall accidents are some of the most common, when a company fails to protect customers from slippery or damaged surfaces. Even a small fall can break bones and cause life-altering injuries. I understand how to pursue a successful premises liability case. By talking to witnesses and gathering evidence, I can build a case that will get you the compensation you need. To calculate a personal injury claim, the final amount depends on many factors. However, it is the amount the victim is willing to accept to give up his or her claim. Many times, this means working with a personal injury attorney to calculate all loss involved. However, though there are some calculators and tools available to give a base settlement, there’s no simple definition. Every case is different. An estimate for pain and suffering, which depends on factors such as emotional loss, loss of companionship, and loss of mental support. Each of these factors must be tallied to determine the personal injury claim. How Do Insurance Companies Evaluate Claims For Pain And Suffering? In a personal injury matter, the pain and suffering portion of a claim can be significant. But how do insurance companies evaluate how much should be offered in settlement when pain and suffering is one element of a claim? There is no clear-cut answer on how to quantify pain and suffering. However, there are relevant factors which are usually considered by the insurance company. Do the medical records reflect an uncomplicated recovery or a difficult one? Two individuals with the exact same injury may have two very different stories of recovery. Often times, the story is told by a detailed review of the medical records from the treating physicians. While more doctor visits or more medical records do not always mean a higher settlement, they are often times a good indication of how routine or complicated a recovery was. Was there a pre-existing condition? If there was a prior injury to the same body part, even if the plaintiff had fully recovered from that pre-existing injury, its existence can reduce the value of a settlement. There is always the chance that a jury will believe that the prior injury accounts for some of the pain and suffering the plaintiff endured following his or her accident. Pre-existing injuries can often times be minimized but are never helpful to a case. Insurance companies often undertake surveillance efforts in order to confirm the claimant’s allegations of pain and suffering are not fabricated. If surveillance demonstrates a physical activity level inconsistent with that alleged by the plaintiff, he or her pain and suffering claim can be seriously compromised. Are you not able to participate in activities as a result of your injury? If someone has been unable to actively participate in the activities of their children or spouse and has not been able to take part in a sport that they enjoy the element of pain and suffering may be higher when compared to someone in a different circumstance. New York, like every other state, sets a time limit for filing a personal injury lawsuit. The time limit is called the statute of limitations (SOL), and begins running on the date of the incident that is the subject of the lawsuit. 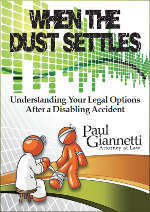 A lawsuit for a personal injury must be brought within three years of the date of the injury. This includes injuries incurred in car, boat, truck, motorcycle, bicycle or pedestrian, accidents. Slip and fall incidents, dog bites, or any other personal injury accident. The time begins running on the date the incident occurred. Two years and six months from the date of the act or omission that gives rise to the law suit. If there was a continuous course of treatment, the time is two years and six months from the date of the last treatment. If the SOL runs out, the injured person will be barred from ever collecting damages for his or her injuries no matter how seriously they were hurt. Who Is the Best Attorney for Your Case? Only you can decide the best attorney for your case. The decision is highly personal and can a big difference with your satisfaction level. First, you should decide whether or not you would like a large law firm or small law firm to handle your case. For some people, a small firm is preferred. In my office I am the only attorney. Therefore when you have an issue or concern, you know that I will be the person in charge of your case. I will attend your hearing, depositions and have the ultimate responsibility for your matter. Some people prefer a large law firm. They like the aura of having many attorneys in the firm and believe that a large firm can do more for them than a smaller firm. In a large firm, you may be dealing with different attorneys on different days or at different stages in your case. Some clients believe that is helpful to a case and others would prefer knowing who is handling the case at all times. If this is a concern, it is always best to ask at the time of your initial consultation how many attorneys will be handling your particular matter. In determining who would be the best attorney for your case, another question to ask at the initial consultation is how you will be kept informed about your case. Some firms prefer clients who want their case on autopilot; who will let the firm handle the case, not ask many questions, and hope for the best result. Other clients believe that it is important to have an attorney that is accessible and can answer relevant questions as the case progresses. They believe being informed about the status of their case is of the utmost importance. Doing your best to investigate how a law firm operates on a day-to-day basis will go a long way in helping you to choose the best attorney for your case. Another factor may involve whether or not your attorney represents both insurance companies and injured workers. While our firm represents only the injured worker, many firms represent both insurance companies and injured workers. Many clients don’t feel comfortable retaining an attorney who actually represents insurance companies on other matters. This is a personal decision but it is always a good question to ask before retaining an attorney. Finally, your “gut feeling” can play a large roll in deciding whether or not to retain a particular law firm or attorney. After speaking with an attorney on the phone or attending a face-to-face consultation, you will probably have a good idea whether or not that attorney is best for your case. As your attorney, it is my job to prove that your injuries were the result of a person’s or a company’s negligence. Using investigative tools and witness testimony, I am persistent in my pursuit for evidence on your behalf. I have helped hundreds of clients to get much-needed compensation following an accident. As your legal advocate, I leave no stone unturned in the quest for a satisfactory outcome in your case. I will do everything I can to see that you win. If you or a loved one has been hurt in Albany or Upstate New York, please contact my firm for a free consultation. I can quickly tell you whether you have a case, and give you advice on how to move forward. I look forward to hearing from you.